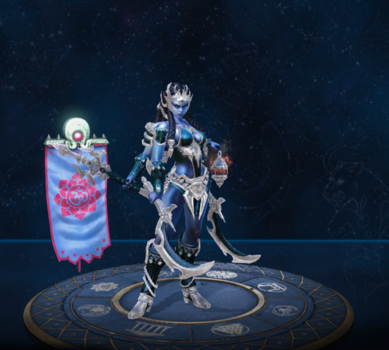 Kali is one of the playable Gods in SMITE. Can deal up to 105/135/165/195/225 (+60% of your physical power) damage with all three blades and bleeds for a total of 30/60/90/120/150 (+30% of your physical power) damage. Can deal up to 200/240/315/360/450 (+40/40/45/45/50% of your physical power) damage. The health restore is affected by healing reduction. Using this item fires a bolt that travels 70 units, stopping on the first god hit, dealing 15% of the targets Current Health as True Damage. 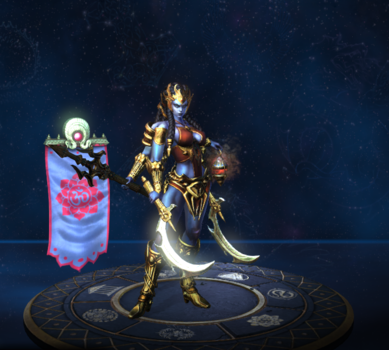 Kali was one of the 12 playable gods in the Alpha build of SMITE's first presentation to the public at PAX Prime 2011. Kali was a free starter character for every new player account created before July 10, 2013. Kali and Rama are the only gods who doen't make jokes. 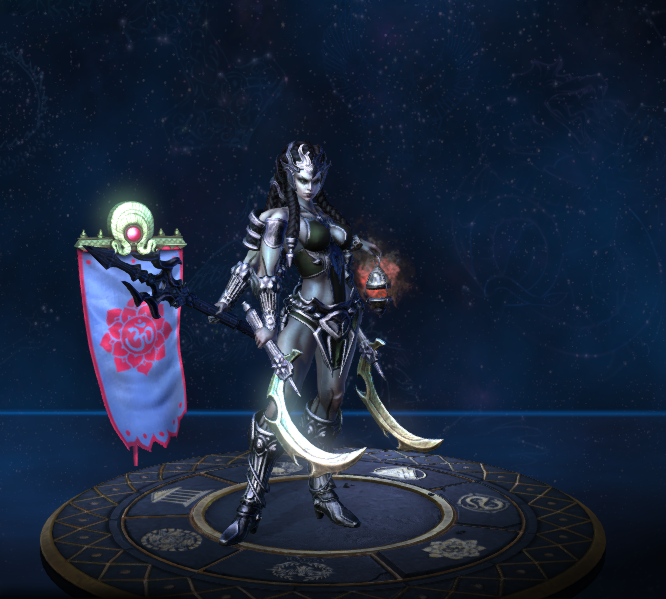 Kali received a major rework that was released with SMITE Beta Version 0.1.1875.1. For more information about the old kit, see Replaced abilities. 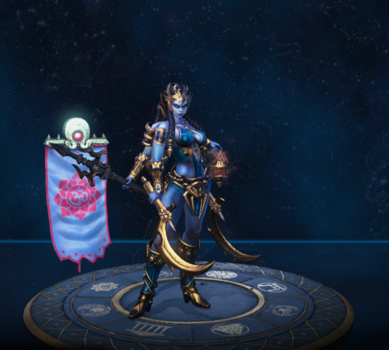 Before Kali was remodel this skin had Kali mouth driping in blood, probaly a reference to Kali's Lore. This skin was gonna receive a new card art, but due to the artist copying another artist the card was not used. After the fact, community request for the fan art of the artist Jaggudada to be used as the official card art started at social medias, and shortly after Hi-Rez ended up contracting the artist and his card art was used. Kali's Trophy Hunter is a reference to the alien species know as Predators from the film series Predator. 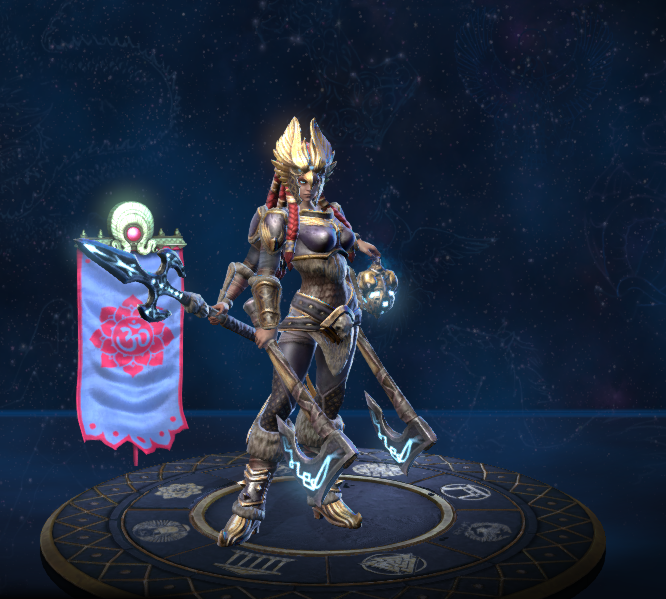 The direct taunt that this skin shares with Dread Queen Serqet is a reference to the cross over movie Alien vs Predator. 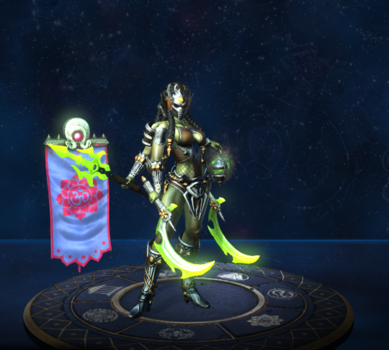 This skin was part of the Summer of Smite 2015 event. 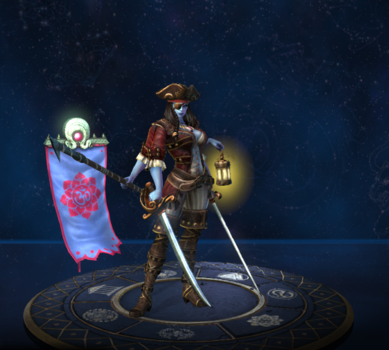 This skin share its theme with BuccaNeith Neith Dreadbeard Poseidon High Seas Sobek Swashbuckler Susano PrivaTyr Tyr and Vulcap'n Redbeard Vulcan. 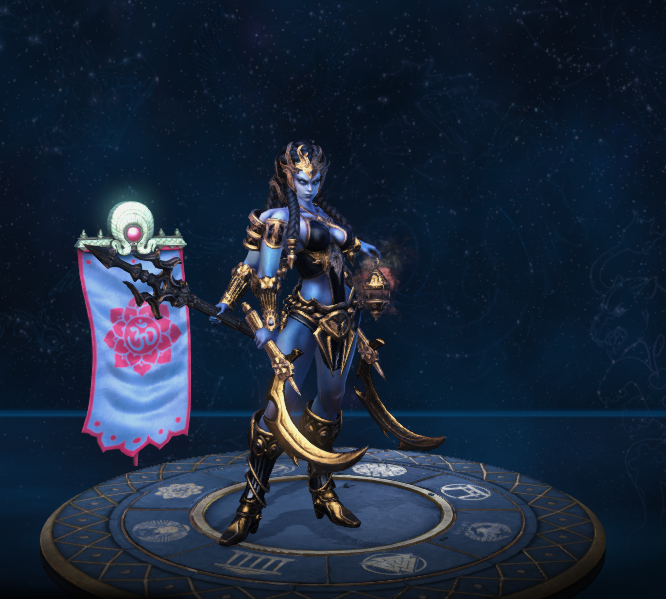 This skin reimagines Kali as a Norse goddess. This skin was part of the event Viking Invasion. This skin shares its theme with Einherjar Chaac and Storm Jarl Chaac. This skin can only be obtained by redeeming a fairly rare 2013 convention skin code. This skin was part of the Viking Invasion event. 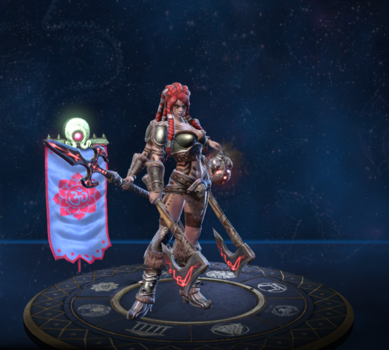 This skin could only be obtained by completing either the Valhalla's Assassin or the Valhalla's Embrace quest from the Viking Invasion event. Fixed an issue where Kali passive meter wouldn't let her choose a new target after respawning. Changed Cooldown from 15/14/13/12/11s to 12s at all ranks. Fixed an issue where Kali could not select a target for her passive in Joust Practice. Fixed an issue where Kali would get stuck upon respawn. Fixed an issue where Kali would be stuck without the ability to select her target. Kali's passive will no longer automatically switch away from a target who is disconnected. This ability now has a new Menu to allow Kali players to select their first target. The selection must be made before taking any other actions at the start of a match. Whenever Kali dies, she may change targets through the same Menu. 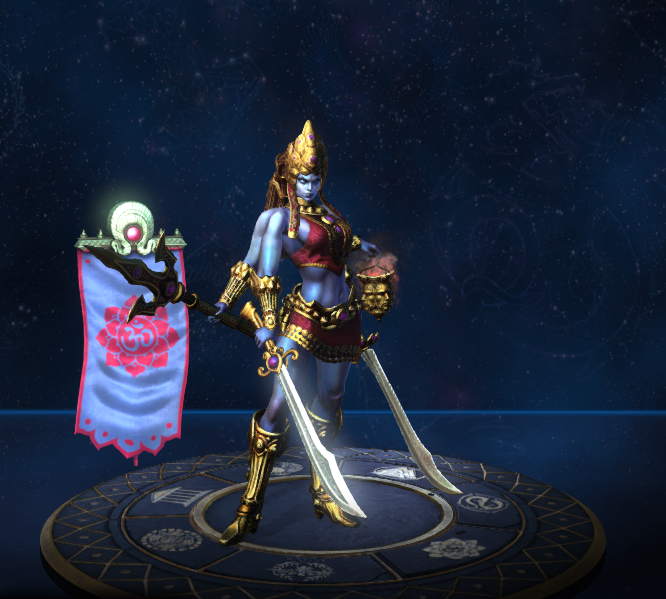 Upon killing a target, Marked for Death will now select the closest God to Kali to become her next target. Fixed an issue where Trophy Hunter's basic attack swing FX were displaying incorrectly. 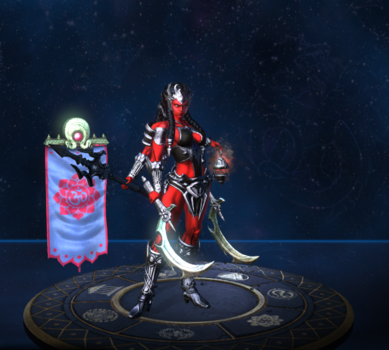 Fixed Kali is receiving Bloodforge passive on assists if the target is her passive mark. Fixed an issue where Kali was getting the wrong XP and Gold values on assists of her marked targets. Fixed Kali's ultimate fx persisting on her. Tooltip updated to properly display 10% + 1%, rather than 10 + 1. Fixed Lifesteal being granted on targets with Shield of the Underworld. Fixed Roots not properly shedding. Fixed an issue where she would get an assist if an enemy god died within 5s of gaining mark. Fixed her basic attack animations cutting off when at high attack speed. Kali's Mark now has an indicator next to their health bar that only Kali can see. This is for Kali to more quickly identify her target. Kali's Mark is now revealed to her teammates when the mark is under 25% health. This appears as a unique special FX. No longer grants lifesteal vs Siege Juggernauts and Titans. Fixed a hit progression exploit that involved Nimble Strike. If under 15% health at the end of channeling this ability, Kali now heals to 15% of her maximum health. Lash may now be targeted inside of walls. (It could always be targeted through walls, but previously would not allow placement in walls). Duration of Physical Power buff increased from 3/3.5/4/4.5/5 to 4/5/6/7/8. Kali’s voice pack and audio have been improved to match her new artistic treatment. 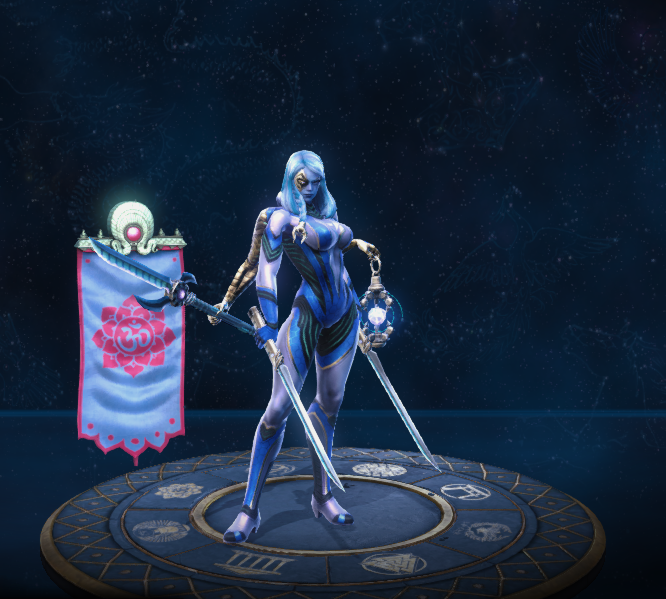 Added a passive meter animation and sound FX that plays when she kills her Marked target or it changes. Fixed some unspecified Kali bugs. Kali has recieved a major visual and kit overhaul. FX on her abilities have been updated. This ability has been changed so that she always gains 20% lifesteal for 5s when dropping below 25% health that refreshes as her health stays low. The cooldown of this ability has been changed from 15s at all ranks to 15/14/13/12/11s. The cooldown of this ability has been reduced from 90/85/80/75/70s to 80/75/70/65/60s. This ability is now usable while under the effects of Fenrir's Bite. The base damage has been reduced from 85/155/225/295/365 to 75/140/205/270/335. The physical power contribution has been reduced from 110% to 100%. The damage per tick on the Bleed has been reduced from 5/10/15/20/25 to 3/6/9/12/15. The base damage has been reverted back to the last patch values from 60/80/100/120/140 to 60/75/90/105/120. Kali now heals an additional 20% from any targets hit that were affected by her Bleed. The delay between the damage being done and the heal being applied to Kali has been removed. The damage per tick has been increased from 60/75/90/105/120 to 60/80/100/120/140. The physical power contribution per tick has been increased from 15% to 20%. The base healing of this ability has been reduced from 60/90/120/150/180 to 50/70/90/110/130 per target hit, up to 3. Physical power contribution has been added to this ability, increasing by 30% of your physical power per target hit, up to 3. Physical power contribution has been reduced from 150% to 110%. This ability now breaks all cc on Kali upon activation. Increased the amount Kali is healed per enemy hit from 50/65/80/95/110 to 60/90/120/150/180. The number of enemies that Kali can heal from has been capped at 3. Has been changed to deal physical damage. Damage and healing now scales off 30% and 20% of physical power, respectively. Now scales off 15% of physical power per hit. 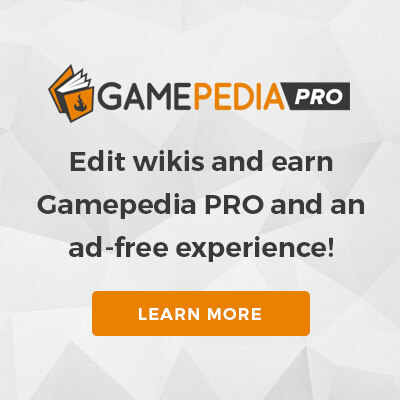 This page was last edited on 25 February 2019, at 22:39.